I have three UFO's left: my bee blocks quilt- which are starting to show up in the mail now and then (two are stuck in Canada, due to the postal strike up there), my improv quilt (quilting it on Wednesday at a friend's house), and my Hushabye quilt (seen below). Not too bad, right? I am finally letting myself start some new things. 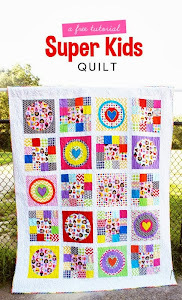 For my Sherpet Pips stash, I decided to go with a pattern in Elizabeth Hartman's book - The Practical Guide to Patchwork. I am doing the "bird Bath" pattern, choosing to fussy cut the centers with Pips. I haven't added the corner triangles yet because I haven't decided if I am going to use a solid or prints. This one is my favorite - the gray Sanctuary print looks like wind/snow. In true Laurie fashion, I have decided to make the quilt bigger than the pattern calls for. Elizabeth recommends 30 blocks, I am planning to do 72. These blocks are taking me forever because I am really having trouble achieving a perfect, scant 1/4" seam. Please don't judge me! I know that's supposed to be one of the "basics" of quilt making - but the Janome quarter inch foot makes a seam much bigger than 1/4", my machine does not have the capability to move the needle, and the post-it's and tape methods are just not working. I am visiting a Janome dealer this week to get help with the 1/4" issue - there is another 1/4" foot I haven't tried - so hopefully that might work? So far I haven't used the coordinates from SP, just digging through my stash of reds, grays, blues, and pinks. I am continuing to agonize over my fabric choices for the Dotty for Dresden quilt but plan to cut that ASAP as well. I don't mind starting several projects at once - it's good to have the variety. 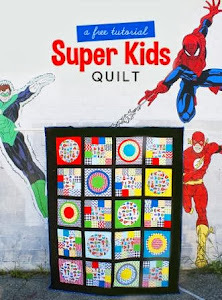 What I don't plan on doing is allowing ten and twenty quilt tops to pile up without quilting them - I will not be making that mistake again!!!!! Thanks for the congratulations on yesterday's post! It was so exciting! Now to reveal the fabrics: I filled a big bag with all sorts of stuff but this post is just showcasing the vintage prints. The other fabrics I bought aren't as exciting - just plain things like some blue shirting, a white linen blend, etc. Most of the pieces aren't too big but that's okay - I don't need yards and yards of the stuff! The quality of vintage fabric is questionable - you all know that I am not a fan of anything less than "quilt shop quality." But I am not a fabric snob when it comes to vintage fabrics - if I like the pattern - that's all that matters. I plan on making a simple patchwork square quilt out of my vintage fabrics - no intricate piecing and something simple to showcase the prints. But the real find was this AMAZING sewing machine!!!! It's an Elna Air Electronic SU machine. The reviews I have found online are excellent ("you'll have to pry it from my cold dead hands," "I doubt any sewer who has one will part with it. they just don't make them like that anymore," "I like how it is lightweight and portable, yet it is all metal and sturdy") and they go for about $375 on ebay. The Elna name is still around (bought by Janome) but the original Switzerland company that made the older machines is gone. The machine has the capability to do lots of decorative stitches, but you have to have these small black discs called "cams." My machine only had one and they go for at least $5 a piece on eBay. I am not going to try and buy a whole bunch online (you might as well as buy a new machine rather than constantly dropping $30-$50 for 6-10 cams) but will keep my eye out for deals. I haven't played with it too much because the lady said she would send me the manual and I have not received it yet (if she doesn't send it soon, I can buy a PDF version online for about $7). I also know that it needs to be cleaned/oiled - which will have to wait. But I am so thrilled to satisfy my small longing for a new machine by instead getting a sweet little 1954 Swiss made gem! I bought this machine plus a large (used) rotary mat, a trash bag full of fabric (more on that tomorrow), a brand new bag of cotton batting, a vintage puzzle ball, a brand new wooden lap quilting frame, and a shoebox full of new sewing notions all for only $20. This was an AMAZING deal! I am not really sure what to call this thing I just made but I think that "Sewing Kit" will suffice. I wanted to make something that could carry sewing tools, notions, and hold a current project. I had admired a friend's at some BMQG events and knew that I could improvise my own pattern that would work for my needs. For the outside I used some fabrics I had received in swaps. The purple fabric is a 2009 Echino Peacock print, there is some Amy Butler Wallflower mustard (wish I had more than a FQ of this! ), and I bound it with some AMH Garden Party fabric. I quilted the outside and lining with straight line quilting (time consuming, but worth it!). I used a large piece of white wool felt to store pins, needles, and safety pins. The blue polka dot on the right is a large zipper pouch for whatever else I want to have with me - I will most likely put whatever hand-sewing project I may be working on in there. This is the first time I have installed a zipper and let's just say that the design of this sewing kit lends itself to hiding the serious errors I made (namely not lining up the top and bottom pieces evenly). I am really enjoying doing all of these "smaller projects" after doing several large quilts that require months of attention. I may force myself to complete all of my UFO's (there are 4) before I allow myself to start a whole new project - but I am really getting anxious to get going on some newer things..... I have pretty stacks of fabrics set aside and can't wait to get started! Completing this bag feels like a serious accomplishment. There were at least 26 different pieces of fabric - 24 of which had to be lined with interfacing. Cutting out all of the pieces took the same amount of time as it did to sew it all together. The pattern comes from Amy Butler's newest book: Style Stitches. For the outside of the bag, I used some Echino fabric I had received for Christmas (I had planned to use the fabric for pillows but changed my mind), Heather Bailey's Pop Garden Peonies in Pink for the lining, and Amy Butler Green Dot from the Love collection for the handles. I took a lot of advice from this post when I made the bag. I ended up using lots of fusible fleece instead of the woven interfacing - I am still shocked that the bag is still so floppy with all of that reinforcement. But it's still got decent structure and was worth it to deal with all of those layers. The funny thing about owning a bag this so big is that I often only carry my wallet, cell phone, and keys with me.... I am kind of a minimalist when it comes to what I am willing to carry around with me all day. But I still love it and I am looking forward to using it soon. I frequent yard sales A LOT during the spring/summer/fall. Often, I manage to find crafty items at yard sales. I recently made a vow to not go TOO wild on craft stuff this year - but I couldn't resist all of this adorable vintage baby ric-rac: and I was thrilled to find 4 packaged pillow forms that I plan to make quilted covers for to match my new quilt. Last time I needed a pillow form, I decided to make one after seeing that they sell for $15+ at Joann's. I am happy that I could buy 4 of them for $4 and not have to bother with the hassle of making them! On Friday, I long-arm quilted my African quilt. I am SO, SO happy with it!!!! This picture is just a sneak-peek. I plan to bind it this week and do a full post featuring its' completion. Speaking of binding, I had to break my fabric diet to buy some Kona Pacific to bind the African quilt. I brought in my remaining 10" to the Fabric Corner to make sure that I bought the right color that I had already used in the wedges of the dresden plates. I just need to vent here for a moment: I am not impressed by any company that cannot consistently provide the exact colors that they're supposed to be. See the picture below - the difference between the two "Kona Pacific" colors is drastic (more so in person than the picture portrays). "Different dye lots" is just not an acceptable explanation. As solid fabric prices are gradually approaching the cost of premium designer prints - I don't think it's too much to ask that they print their colors consistently! Even the store clerk agreed with me that they were too different shades of blue. I love it and cannot wait to see what the other members create.